Familial hemophagocytic lymphohistiocytosis type 2 (FHL2) is a cytokine storm syndrome characterized by immune hyperactivation with viral infection due to a CD8 T cell cytotoxic killing defect secondary to a perforin deficiency. As most studies of FHL2 mice have used pathogen-naive animals, the effects of immune memory on FHL2 are understudied. We used an immunization model of the perforin-deficient mouse to study the effects of immune memory on FHL2. Prior CD8 T cell–specific Ag exposure leads to enhanced hemophagocytic lymphohistiocytosis with increased morbidity and decreased time to mortality. Enhanced disease is associated with altered cytokine production and T cell proliferation. Response to IFN-γ blockade is reduced and TNF-α gains a pathogenic role, although blockade of the IL-33 receptor ST2 remains effective. These results suggest that pre-existing immune memory may worsen the outcome and alter the treatment response for FHL2 patients who may not be naive to their immune triggers. Familial hemophagocytic lymphohistiocytosis type 2 (FHL2) is a classic genetic form of hemophagocytic lymphohistiocytosis (HLH) caused by mutations within the perforin gene that limit cytolytic elimination of viral infections by CD8 T cells and NK cells (1). This disease affects infants early in life and has a high mortality rate (2, 3). Currently, the only viable treatment option for FHL2 is immunochemotherapy followed by bone marrow transplant (3, 4), but other biologically directed therapies, including IFN-γ blockade, have demonstrated effectiveness in mouse models (5–8) and are being tested in ongoing clinical trials (ClinicalTrials.gov identifier NCT01818492) (9). The murine model of FHL2 uses the perforin-deficient mouse (Prf1−/−) on the C57BL/6 (B6) genetic background (8). In this model, FHL is triggered by the lymphocytic choriomeningitis virus (LCMV), a virus that would normally be cleared by the CD8 T cell cytolytic response in perforin-sufficient mice. Prf1−/− mice develop lethal HLH secondary to CD8 T cell–mediated IFN-γ production, as CD8 T cell depletion or IFN-γ neutralization protect Prf1−/− mice from disease. We have additionally shown that blockade of the IL-33 receptor ST2 is also able to prevent disease and lower IFN-γ levels (5). However, other cytokines including TNF-α do not contribute to disease progression (8). All previous studies of the B6 Prf1−/− murine model of FHL2 have been performed in immunologically naive mice. A previous study by Badovinac et al. demonstrated that unlike B6 Prf1−/− mice, naive BALB/c Prf1−/− mice did not develop mortality upon LCMV infection (10). However, immunization with CD8 T cell, LCMV-specific peptides prior to infection rendered these mice susceptible to an IFN-γ–dependent mortality similar to FHL2 (10). Unlike the BALB/c Prf1−/− mouse, the B6 Prf1−/− mouse develops HLH disease on first exposure to the virus without the need for prior immunization. Although the Badovinac study does mention that immunization of B6 Prf1−/− mice followed by LCMV infection results in mortality with LCMV-specific CD8 T cell expansion (as do naive B6 Prf1−/− mice), these data were not shown as the focus of the report was on the BALB/c model. A full immunologic dissection or comparison to unimmunized mice was also not presented in the B6 model (10). We therefore questioned whether the naive, predisposed B6 Prf1−/− model would develop alterations in disease upon immunization prior to infection, much like the BALB/c model switches from resistant to permissive with immunization. Humans with FHL2 may not have a truly naive immune response to their viral trigger, as they could possess a pre-existing memory T cell response to an HLH trigger without prior exposure to this specific trigger. Given the integral role of CD8 T cells in FHL2 and the known differences in the immune response of memory CD8 T cells compared with naive T cells, we hypothesized that CD8 T cell memory may act as an important modifier of FHL2. C57BL/6 (wild type) and perforin-deficient (C57BL/6-Prf1tm1Sdz/J, Prf1−/−) mice were obtained from the Jackson Laboratory and bred in the Abramson Research Center Animal Facility at The Children's Hospital of Philadelphia. All animal studies were performed according to The Children’s Hospital of Philadelphia Institutional Animal Care and Use Committee. A previously published protocol for peptide-coated dendritic cell (DC) immunization was adapted for this study (11). Briefly, Flt3L-induced splenic DCs were isolated with CD11c magnetic beads and pulsed with LCMV peptides (2 μM) for 2 h. gp33 and NP396 purified peptide were obtained from GenScript. In total, 2.5 × 105 DCs were injected retro-orbitally into 4–8 wk old Prf1−/− mice. Control mice were injected with equal numbers of unpulsed DCs. Mice between the ages of 8–12 wk were injected i.p. with 2 × 105 PFUs of LCMV Armstrong strain. Mice were euthanized if they developed significant morbidity or excessive weight loss (>20% total body weight). Viral titers were measured using plaque assay with Vero cells as previously described (12). Spleen and liver weights were obtained from mice sacrificed on day 7 postinfection. For pathologic analysis, organs were fixed overnight in 4% paraformaldehyde, imbedded in paraffin, and stained with H&E. Images were obtained and lymphocytic nodules were quantified as the average number per high power field, with three fields sampled. Splenocytes were obtained following single-cell suspension and RBC lysis. Staining was performed with LIVE/DEAD fixable viability dye (Life Technologies) and CD4, CD8α, CD44, CD90.2, IFN-γ, and TNF-α (BD Biosciences, BioLegend). The H-2Dbgp33–41 MHC-peptide tetramer was used for Ag-specific CD8 T cell identification and was provided as fluorophore-conjugated tetramers by E.J.W. All samples were acquired on a MACSQuant flow cytometer (Miltenyi Biotec) and analyzed using FlowJo software version 10. In total, 106 splenocytes were cultured without peptide or with 0.2 μM LCMV gp33 peptide, NP396 peptide for 5 h. IFN-γ positivity by flow cytometry was used to identify LCMV-specific cells (13). Weight loss data were analyzed by linear mixed-effects models using R (R Core Team, 2014). Survival statistical analysis was performed by log-rank Mantel–Cox test. GraphPad Prism 5 was used for statistical testing and p values were calculated using a two-way Student t test or two-way ANOVA when appropriate. Rat anti-mouse ST2-blocking Ab and mouse IgG1 isotype control Ab were provided by Amgen. LCMV-infected mice were injected i.p. with 150 μg ST2 blocking Ab or isotype control every other day beginning on day 2 postinfection (14). All other neutralizing and isotype control Abs were obtained from Bio X Cell. Rat anti-mouse IFN-γ (XMG1.2, 0.5 mg), rat anti-mouse TNF-α (XT3.11, 1 mg), and rat IgG2a isotype control (2A3, 0.5 mg) were injected i.p. every third day beginning on day 2 postinfection (8). We first examined differences between B6 Prf1−/− HLH responses in naive mice and mice immunized against the CD8 LCMV epitopes gp33 and NP396 using a well-characterized DC immunization protocol (15). Control mice were treated with the same immunization protocol without peptide exposure. Then 30 d after priming the CD8 T cell memory response, we compared the development of HLH in immunized and control mice prior to LCMV infection. Immunization with gp33-loaded DCs led to the development of significant numbers of CD8+ T cells capable of making rapid IFN-γ responses to gp33 restimulation, consistent with a memory response, which was absent in control immunized mice (Fig. 1A). Similar development of rapidly responding peptide-specific CD8 memory T cells was seen with NP396 peptide, confirming this immunization approach with multiple peptides (data not shown). Prf1−/− mice exhibit increased immunopathology with prior CD8 T cell memory secondary to immunization. Prf1−/− mice were immunized with gp33, NP396, or control DCs, rested for 30 d and either sacrificed prior to infection or infected with LCMV. Following LCMV infection, mice were sacrificed on day 7 postinfection or monitored for survival. (A) Prior to infection, total IFN-γ–producing gp33-specific CD8 T cells per spleen (CD90, CD8, CD44, IFN-γ) as represented by IFN-γ production in response to gp33 peptide restimulation in immunized and control mice (n = 3). (B) Survival of gp33 and NP396 CD8 T cell–immunized mice with LCMV infection following 30 d rest period compared with control mice. Analyzed by log-rank Mantel–Cox test. *p < 0.05 for control compared with both immunization groups (n = 5–6 per group). (C) Percent body mass weight loss of gp33-immunized Prf1−/− mice versus control. *p < 0.05 by linear mixed effects modeling (n = 5/group). (D) Comparison of hematologic parameters (n = 5–7) on day 7 postinfection with LCMV. (E) Comparison of lymphocytic nodular infiltration (lymphocytic nodules per high-power field) in the liver in gp33 immunized or control mice and representative sections (n = 6–8). (F) Comparison of ferritin (n = 9–10) and sCD25/IL-2R (n = 9–12) in serum on day 7 postinfection with LCMV. All experiments represent at minimum two independent experiments. *p < 0.05 by two-way Student t test except as indicated. Following infection and triggering of HLH, immunization led to significantly increased mortality. For gp33-immunized mice, average survival after LCMV infection decreased from 14 d in control mice to 9 d in immunized mice (Fig. 1B). A similar decrease in time to mortality was seen following NP396 immunization (Fig. 1B), indicating that increased disease severity occurs with CD8 T cell memory against multiple epitope specificities. Immunization-enhanced HLH was associated with significant increases in other markers of HLH disease activity including accelerated weight loss (Fig. 1C), and more severe anemia and thrombocytopenia (Fig. 1D). As there were no differences in the enhanced response comparing gp33 immunization to NP396 immunization (data not shown), all further experiments focus on the gp33 immunization. Hepatitis was markedly enhanced in immunized Prf1−/− mice compared with control mice, with significantly more inflammatory lobular infiltrates (Fig. 1E). Also consistent with increased disease severity, gp33-immunized mice had an elevation of serum markers of HLH, including significantly elevated ferritin and a trend toward elevated sCD25/IL-2Ra (Fig. 1F). Taken together, these results demonstrate that gp33 immunization and resultant CD8 T cell LCMV directed memory enhance LCMV-induced HLH in B6 Prf1−/− mice. To characterize the immune milieu that correlated with immunization-enhanced HLH, mice were sacrificed on day 7 postinfection. Serum levels of IFN-γ were significantly elevated in immunized mice compared with controls. Serum levels of the proinflammatory cytokines IL-6 and TNF-α were unchanged in immunized mice, whereas the anti-inflammatory cytokine IL-10 was significantly depressed (Fig. 2A). To characterize the peptide-specific CD8 immune response, spleen cells were obtained on day 7 postinfection and stimulated with gp33 peptide, NP396 peptide, or no peptide. In infected mice, absolute numbers of splenic gp33-specific CD8 T cells in immunized mice were increased 6-fold compared with control mice as shown by IFN-γ production with peptide stimulation (Fig. 2B). 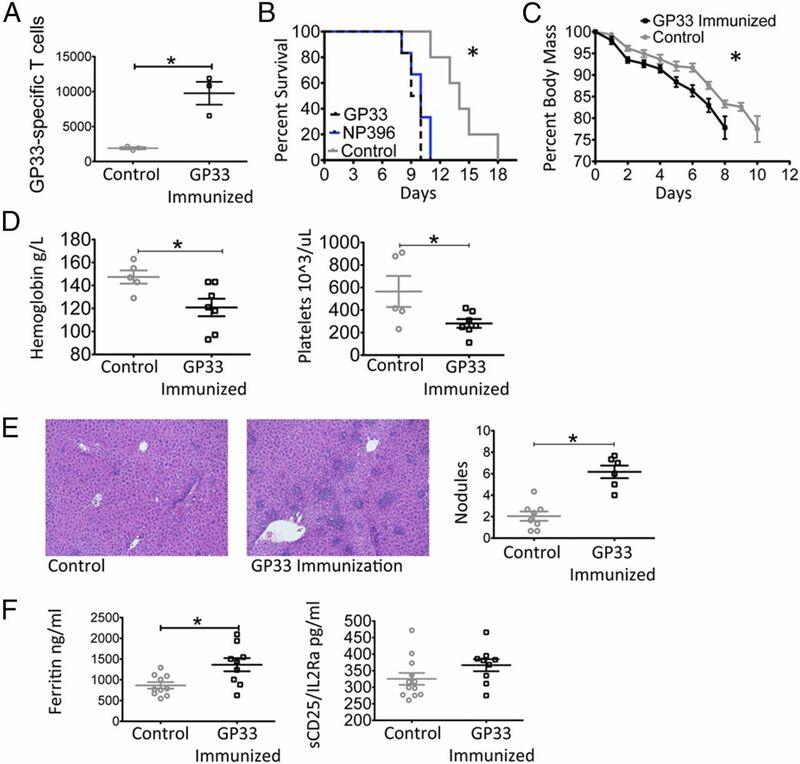 Tetramer staining for gp33-specific CD8 T cells in LCMV-infected mice corroborated this dramatic increase in gp33-specific T cells in immunized mice compared with naive mice (Fig. 2B, Supplemental Fig. 1A). In gp33-immunized mice, gp33-specific CD8 T cells represented almost 45% of total CD8+ T cells compared with approximately 8% in naive mice (Fig. 2C, Supplemental Fig. 1B). 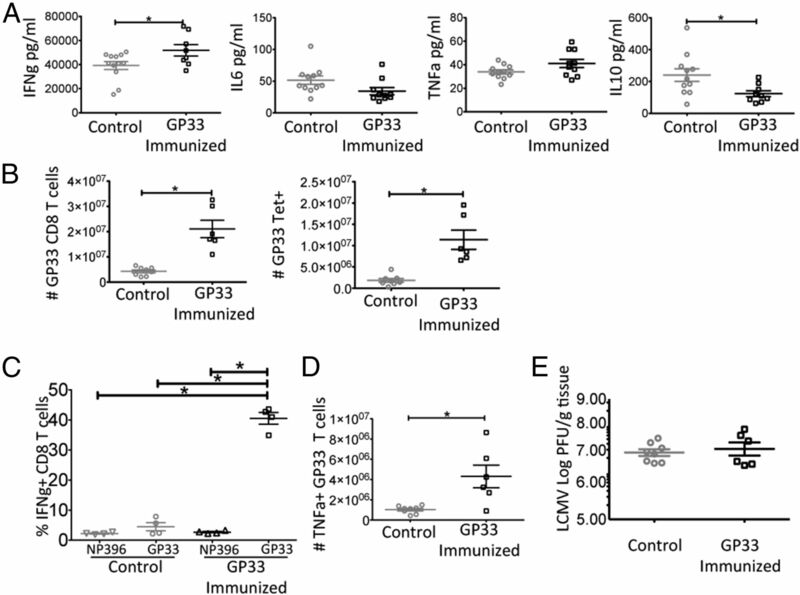 Immunization with gp33 did not result in expansion of unrelated LCMV epitope-specific T cells postinfection, as evidenced by the lack of expansion of NP396-specific cells in gp33 immunized mice compared with naive mice (Fig. 2C, Supplemental Fig. 1B). Thus, the increased pathology seen in immunization-enhanced HLH is associated with expansion of CD8 T cells specific to the peptide used for immunization. Immunization increased the frequency and number of gp33-specific, TNF-α–producing splenic CD8 T cells at day 7 postinfection by 3–4 fold as measured by gp33 peptide restimulation (Fig. 2D, Supplemental Fig. 1C). Importantly, splenic titers of LCMV measured on day 7 postinfection are unchanged by immunization, indicating that despite functional enhancement in the CD8 T cell immune response, the virus is still not cleared by perforin-deficient mice that have been immunized (Fig. 2E). CD8 T cell memory alters the immune profile in enhanced HLH without altering viral load. Prf1−/− mice were immunized against gp33 or control, rested for 30 d, and infected with LCMV. Mice were sacrificed on day 7 postinfection, serum samples were obtained, and splenocytes were stimulated in vitro and analyzed. (A) Serum cytokine levels in immunized and control mice (n = 8–12). (B) Total gp33-specific CD8 T cells (CD90+, CD8+, CD44+, IFN-γ+) in immunized and control mice determined by IFN-γ production following in vitro stimulation (n = 6–8). Total number of gp33-specific CD8 T cells determined by gp33 tetramer staining (CD90+, CD8+, CD44+, gp33 tetramer+) (n = 6–7). (C) Percent of total CD8 T cells specific for gp33 or NP396 determined by IFN-γ production following in vitro peptide stimulation with the respective peptide in gp33 immunized and control mice on day 7 postinfection (CD90+, CD8+, CD44+, IFN-γ+) (n = 4). (D) Then 7 d post–LCMV infection, total number of gp33-specific TNF-α–producing splenic CD8 T cells (CD90+, CD8+, CD44+, TNF-α+) following in vitro peptide stimulation (n = 6–8). (E) LCMV splenic titers (n = 6–8). Log scale is shown. All plots representative of a minimum of two experimental replicates. *p < 0.05 by two-way Student t test. IFN-γ production is one of the primary effector functions of activated CD8 T cells in response to LCMV infection, and has been shown to be a key component of mortality in the naive mouse model of FHL2 (8). IFN-γ neutralization in LCMV-infected naive Prf1−/− mice protects from mortality, which supports the use of IFN-γ neutralization in human HLH patients (9). As IFN-γ neutralization has only been tested in naive mice on the B6 background, we questioned whether IFN-γ blockade would remain effective in immunization-enhanced HLH disease. 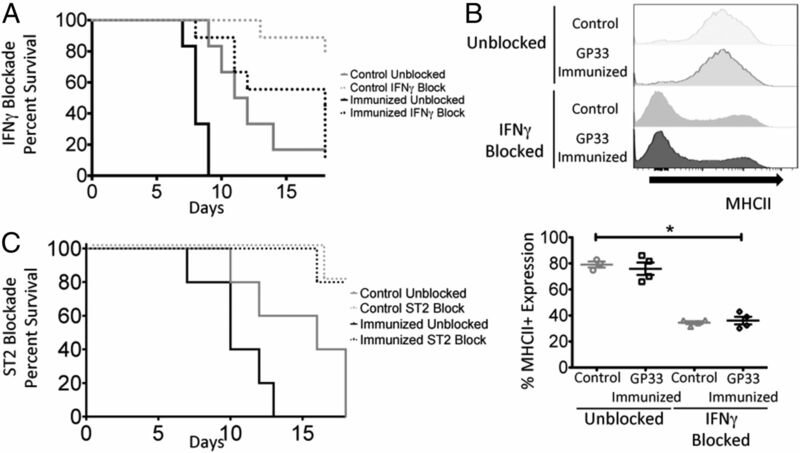 As previously reported, IFN-γ blockade led to significant improvement in survival in unimmunized mice, but surprisingly in gp33-immunized mice, IFN-γ–blocked mice continued to have significant mortality, with an average survival of 15 d postinfection, similar to control mice without IFN-γ blockade (Fig. 3A). Importantly, these mice still had significant improvement in survival compared with immunized mice receiving placebo treatment (average survival 9 d), indicating that IFN-γ continues to play an important role in mortality in enhanced HLH disease. However, these data argued that IFN-γ is not the only component leading to the increased disease severity of enhanced HLH in immunized mice. We considered that the apparent loss of efficacy of IFN-γ blockade in immunized mice might be explained by increased IFN-γ production and therefore an underdosing of blocking Ab and incomplete IFN-γ blockade. 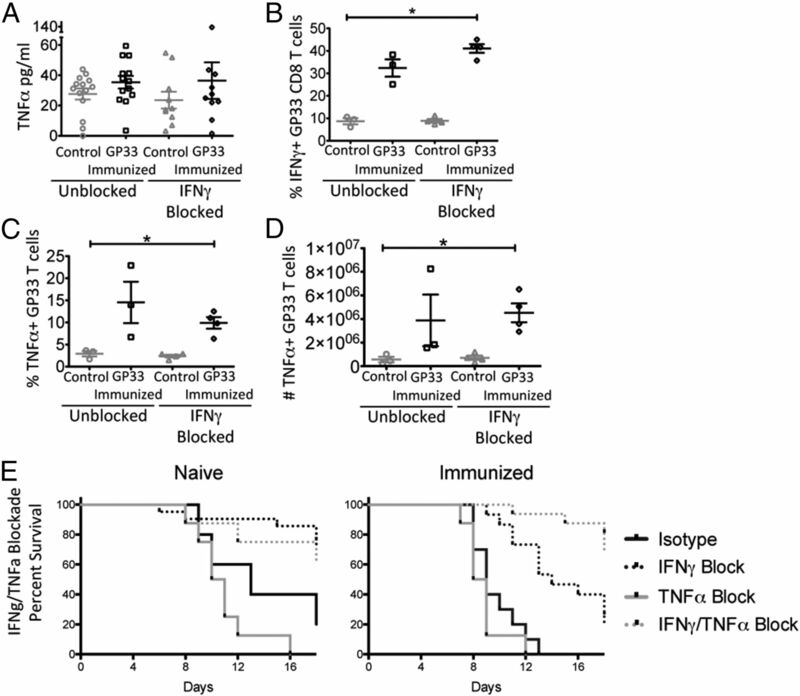 However, IFN-γ blockade as assessed by expression of the IFN-γ–inducible gene product MHC class II on Ly6Chi inflammatory monocytes was equally downregulated with IFN-γ blockade in all groups of mice, suggesting that the pharmacodynamic effects of IFN-γ blockade were comparable between control and immunized mice (Fig. 3B). This indicates that inadequate dosing is not the explanation for the loss of efficacy. Collectively, our data suggest that IFN-γ is not the only factor leading to increased disease severity in immunization-enhanced HLH. CD8 T cell memory alters HLH response to cytokine blockade. (A) Survival of gp33-immunized mice with LCMV infection following 30 d rest period compared with control mice with IFN-γ blockade or isotype control Ab treatment. Mice were injected i.p. starting on day 2 and every 3 d thereafter. Analyzed by log-rank Mantel–Cox test. p < 0.05, n = 6 for unblocked groups, 9 for IFN-γ blocked groups. (B) gp33-immunized and control mice were treated with IFN-γ blockade or isotype control Ab treatment. Mice were injected i.p. starting on day 2 and every 3 d thereafter, and were sacrificed on day 7 postinfection. Inflammatory monocytes were analyzed for MHC class II expression (CD90−, Ly6G−, CD11b+, Ly6Chi, MHC class II) by flow cytometry with representative flow plots. Effect of IFN-γ blockade is significant, with no significant effect of immunization status by two-way ANOVA, *p < 0.05, n = 4 per group. (C) Survival of gp33-immunized mice with LCMV infection following 30 d rest period compared with control mice with ST2 blockade or isotype control Ab treatment. Mice were injected i.p. starting on day 2 and every 2 d thereafter. Analyzed by log-rank Mantel–Cox test. All plots represent minimum of two experimental replicates. p < 0.05, n = 5 for all groups. We have recently shown that blockade of the IL-33 receptor ST2 leads to a decrease in the cytokine storm and enhanced survival in naive FHL2 mice (5). To determine if ST2 blockade would ameliorate disease in immunization-enhanced HLH, we treated LCMV-infected, gp33-immunized Prf1−/− mice with ST2 blocking Ab. Unlike IFN-γ blockade, which lost effectiveness in immunization-enhanced HLH, ST2 blockade remained equally effective in immunized and control mice, with equivalent survival in both immunized and control mice to up to 18 d postinfection (Fig. 3C). These data suggest that ST2 controls both the IFN-γ dependent and independent factors that contribute to immunization-enhanced HLH. We observed that prior immunization resulted in an increase in the number of gp33-specific, TNF-α–producing, splenic CD8+ T cells on day 7 postinfection (Fig. 2D, Supplemental Fig. 1D). We thus hypothesized that increases in TNF-α production by memory CD8 T cells could be an IFN-γ–independent mediator of HLH immunopathology during immunization-enhanced HLH. To this end, we blocked IFN-γ and investigated the immunologic characteristics of immunized and control mice to investigate whether TNF-α may gain importance. Serum TNF-α was not significantly altered in the serum on day 7 postinfection in LCMV-infected gp33-immunized IFN-γ–blocked mice (Fig. 4A). Similarly, IFN-γ blockade did not affect the expansion of gp33-specific IFN-γ+ CD8 T cells (Fig. 4B) or gp33-specific TNF-α+ CD8 T cells (Fig. 4C), although immunized mice continued to have an increased percentage of cytokine-producing cells within the total CD8 T cell compartment. The total number of TNF-α–producing gp33-specific CD8 T cells in immunized mice was increased by ∼4-fold, a difference that remained with IFN-γ blockade (Fig. 4D). Although there was no significant increase in serum TNF-α levels, with the significant expansion of TNF-α–producing gp33-specific CD8 T cells, we hypothesized that TNF-α may be playing an IFN-γ–independent pathogenic role in immunization-enhanced HLH at the tissue level, a role that may emerge with IFN-γ blockade. To test this hypothesis, TNF-α and IFN-γ were blocked in gp33-immunized mice to determine whether dual blockade would enhance survival in immunized mice. Consistent with our hypothesis, TNF-α and IFN-γ dual blockade led to a significant improvement in survival of LCMV-infected gp33-immunized mice, equaling the survival of naive mice treated with IFN-γ blockade alone (Fig. 4E). Dual blockade did not result in any measurable increase in survival in naive mice, suggesting the effect of TNF-α was specific to the immunized scenario. Interestingly, TNF-α blockade alone was insufficient to cause a change in survival in either the naive or immunize mice, suggesting its effects can only be ascertained in the background of IFN-γ blockade. TNF-α is produced by memory CD8 T cells and contributes to mortality in immune memory HLH. Prf1−/− mice were immunized against gp33 or with control procedure, rested for 30 d, infected with LCMV, and treated with either IFN-γ blockade or isotype control beginning day 2 postinfection, and every 3 d thereafter. Mice were sacrificed on day 7 postinfection. (A) Serum TNF-α shows no difference in immune memory compared with control and this is unaffected by IFN-γ blockade. Not significant by two-way ANOVA (n = 10–14, pooled two experimental replicates). (B) Percent gp33-specific memory CD8 T cells of total splenic CD8 T cells. Expansion is unaffected by IFN-γ blockade (CD90, CD8, CD44, IFN-γ); however, the effect of immune memory is significant by two-way ANOVA, *p < 0.05. IFN-γ blockade has no effect (n = 3–4, two experimental replicates). (C) Percent TNF-α–producing gp33-specific CD8 T cells of total splenic CD8 T cells. Expansion is unaffected by IFN-γ blockade (CD90, CD8, CD44, TNF-α); however, the effect of immune memory is significant by two-way ANOVA, *p < 0.05 (n = 3–4, two experimental replicates). (D) Total number of splenic TNF-α–producing gp33-specific CD8 T cells in immunized and control mice with or without IFN-γ blockade (CD90, CD8, CD44, TNF-α). IFN-γ blockade has no effect (n = 3–4, two experimental replicates). Effect of immune memory is significant by two-way ANOVA, *p < 0.05. (E) Mice were treated beginning day 2 postinfection, and every 3 d thereafter with isotype control, IFN-γ blockade only, TNF-α blockade only, or IFN-γ/TNF-α dual blockade following infection. Left panel shows control unimmunized mice; right panel shows immunized mice. Analyzed by log-rank Mantel–Cox test. *p < 0.0001, pooled experiments, n = 5–15 mice per group. Taken together, these results show that in FHL2 on the B6 permissive background, pre-existing CD8 T cell memory results in an enhanced HLH disease. This parallels prior observations that on the resistant BALB/c background, pre-existing CD8 T cell memory makes disease permissive (10). However, unlike the BALB/c model, immunization in B6 mice results in a qualitative difference, with prominence of other cytokines in addition to IFN-γ and specifically with TNF-α gaining a pathogenic role as an effector cytokine. Interestingly, ST2 blockade retains its efficacy, suggesting this is an upstream mediator of disease that is unaltered by memory status. Further work in human patients and in other mouse models of HLH will be needed to generalize these findings to other HLH syndromes beyond FHL2. However, these results suggest there may exist immunologic scenarios where IFN-γ blockade may not be sufficient to treat HLH and alternative biologic therapies may need to be considered. E.M.B. holds a patent for the method of use of ST2 blockade in FHL. The other authors have no financial conflicts of interest. We thank Lehn Weaver for editorial and experimental feedback during the work. This work was supported by a Nancy Taylor Foundation award (to E.M.B. ), Sean Fischel Connect, and National Institutes of Health Grant R01-AI121250.
. 2014. Familial hemophagocytic lymphohistiocytosis: when rare diseases shed light on immune system functioning. Front. Immunol. 5: 167.
. 2007. HLH-2004: diagnostic and therapeutic guidelines for hemophagocytic lymphohistiocytosis. Pediatr. Blood Cancer 48: 124–131.
. 2011. Chemoimmunotherapy for hemophagocytic lymphohistiocytosis: long-term results of the HLH-94 treatment protocol. Blood 118: 4577–4584. 2015. The role of hematopoietic stem cell transplantation in treatment of hemophagocytic lymphohistiocytosis. Hematol. Oncol. Clin. North Am. 29: 943–959.
. 2016. ST2 contributes to T-cell hyperactivation and fatal hemophagocytic lymphohistiocytosis in mice. Blood 127: 426–435.
. 2016. Therapeutic effect of JAK1/2 blockade on the manifestations of hemophagocytic lymphohistiocytosis in mice. Blood 128: 60–71.
. 2009. Neutralization of IFNgamma defeats haemophagocytosis in LCMV-infected perforin- and Rab27a-deficient mice. EMBO Mol. Med. 1: 112–124.
. 2004. An animal model of hemophagocytic lymphohistiocytosis (HLH): CD8+ T cells and interferon gamma are essential for the disorder. Blood 104: 735–743.
. 2015. A novel targeted approach to the treatment of Hemophagocytic Lymphohistiocytosis (HLH) with an anti-interferon gamma (IFNγ) monoclonal antibody (mAb), NI-0501: first results from a pilot phase 2 study in children with primary HLH. In 57th American Society of Hematology Annual Meeting and Exposition LBA-3, December 5–8. American Society of Hematology, Orlando, FL.
. 2003. Viral infection results in massive CD8+ T cell expansion and mortality in vaccinated perforin-deficient mice. Immunity 18: 463–474.
. 2012. Epitope specificity of memory CD8+ T cells dictates vaccination-induced mortality in LCMV-infected perforin-deficient mice. Eur. J. Immunol. 42: 1488–1499.
. 2009. Inhibition of interleukin-33 signaling attenuates the severity of experimental arthritis. Arthritis Rheum. 60: 738–749.
. 2008. Memory CD8 T cell responses exceeding a large but definable threshold provide long-term immunity to malaria. Proc. Natl. Acad. Sci. USA 105: 14017–14022.